In anticipation of his latest documentary series, Tony Robinson’s Wild West in 3D, I had the pleasure of speaking to the delightful Sir Tony Robinson as he ate breakfast at his London home. Over the course of our conversation, the Blackadder and Time Team star’s flair for history is infectious, as he speaks animatedly about the real life legends behind the three-part series, which employs never-before-seen 3D stereoscopic photographs to tell the true stories of America’s fabled West, from the end of the Civil War in 1865, up until the early 20th Century. “I’ve got raspberries on my muesli!”, Tony declares gleefully at the start of our meeting. “That’s the kind of guy I am. On my gravestone it should say ‘He had raspberries in his muesli’”, he continues in true Baldrickian fashion. The affable Tony then goes on to apologise to his PA, whom he tells me was up late the previous evening caring for his “old and poorly” dog, while he was out babysitting for his daughter-in-law. But anyway, we’re here to talk business, about the infamous Wild West. When I tell Sir Robinson that I studied the topic at university, he is overjoyed to tell me why his Wild West in 3D documentary makes such a “fantastically good series”. “The history is wonderful, the stories are great, and of course, the backdrop is absolutely gorgeous”, he explains. Tony with Bob Boze Bell, editor of True West Magazine, at the site of the gunfight at the OK Corral. So why choose this topic for the show in the first place? Robinson tells me it was while he was looking for dinosaurs in Montana for a Time Team special that he first visited the so-called Wild West: “While I was there I just fell in love with the place completely. I thought, ‘Oh wow, this is cowboy country’. I always hoped that one day I’d be able to go back there and piece together the reality behind the mythology that I’d learnt as a kid”. Did he find that reality to be wildly different from the romanticised mythology we know so well courtesy of Hollywood, in films such as Penn’s Bonnie and Clyde, or Hill’s Butch Cassidy and the Sundance Kid? “Yes and no”, he answers. “As you know, the West was mythologising itself even as it happened. So many of the cowboys were intensely self-aware of their role, and wrote letters to newspapers, and newspaper men came out to visit them. This coincided with the time when electronic communications meant that the stories could be disseminated very quickly, and at a time when books could be produced very swiftly. So the narrative was there from very early on”. Tony continues: “There is a difference between the often rather tawdry reality of these people and the rather heroic way they talked about themselves, but there are parts of the story that were absolutely true. The cowboys were taciturn; they were extremely brave; they were extremely tough … they were just like Clint Eastwood and others have portrayed them”. “Mark Twain called them ‘the first authentic American culture’, and I think there’s a lot of truth in that. They were created almost out of nothing”, he says. “Suddenly it was realised that this great, deserted area in the middle of America was phenomenally good cattle country, and when people started to herd those cattle, they created a costume for themselves – not because it was a cowboy costume, it didn’t come out of a play box – but because they needed a big hat to protect themselves from the sun, they needed big boots so they didn’t get bitten by the snakes, they needed cheap but very thick shirts to protect themselves from the thorns, great elaborate saddles that were pieces of engineering, so they could lasso cattle, and then tie them onto the end of the saddles… It all had an absolute logic about it”. Tony Robinson and Rowan Atkinson in Blackadder II. By now we’ve talked plenty about the Wild West, and I want to know more about the show’s 3D element. What are these ‘3D stereoscopic photographs’ I’ve been hearing so much about, which are tantalisingly described as ‘forgotten images completely unknown to academics’? The answer is nothing short of fascinating. “In fact, 3D has been around for as long as there have been cameras”, explains Robinson. “In the 1880s, it was enormously popular, and very cheap. You got one of those holders which looks like a small coat hanger with two photographs taken just a couple of inches apart, and you look into them both and your eye melds them both together and gives you a 3D image”. So this purportedly new technology is actually harking back to what they were doing all those years ago? “Well, you know how television always says ‘this has never been before seen on television’? It’s actually true in this case!”, says Tony. “A lot of the images that we show never have been shown on television, because there never was 3D television before … It’s rescuing what they were doing back then”. Before I let Tony get on with his day, the topic turns to what we’re watching on television. He tells me he’s currently loving Abi Morgan’s River on BBC One, which stars Nicola Walker as a policewoman who’s actually a ghost. And finally, while it’s only early November and yet the Christmas lights are already up on Oxford Street, what would Sir Robinson like to receive from Santa Claus? “A pair of six-guns, a belt and a big hat”. 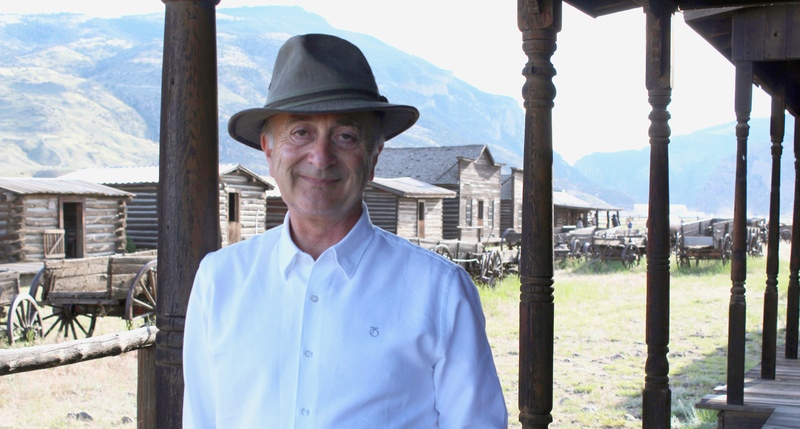 Tony Robinson’s Wild West in 3D starts on Sunday November 8th at 8pm, only on Discovery Channel UK.